The future of chess has been in question ever since Bobby Fischer abdicated his world championship crown in 1975. Fischer had broken the Soviet juggernaut single-handedly and was poised to bring chess the type of exposure that would draw sponsorships far and near. However, the title soon fell back into the Soviet hands and would remain there for another thirty years thereafter. Within this span of thirty years, the championship cycle has been in turmoil and there have been many changes in chess. Databases and internet chess have changed the game immeasurably and the novelty of "Man vs. Machine" has worn off since the machines have proven to comparable to the world's best human players. Fischer had long asserted that "chess was dead," and advocated "Fischer Random" chess as a way to keep chess from being solved. He died believing that the future of chess lay in removing the advantage garnered by the use of opening databases. However, there is another problem… competition from other activities like internet entertainment, poker and video games have affected the viability of chess even though youth are still attracted by its intrigue. Chess clubs are drying up and tournaments are losing players. FIDE still struggles to win sponsorships for its major championship matches and the top tournaments are dominated by a handful of players. 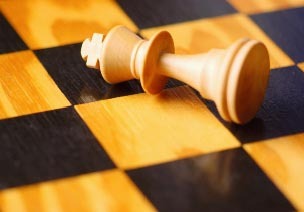 However, the question remains whether chess will find its way. How does FIDE make chess more accessible to fuel growth? Is chess dead? Certainly not, but chess growth will no longer be measured by old standards. The good thing is that the capitol of chess will begin to shift away from Europe and take root in other regions. China and India will assure that chess will have healthy growth and as the top level becomes more diversified, there will be a resurgence in interest. Perhaps the developing chess regions is what will maintain the growth of chess since chess is suffering both in America and in some European nations. Is chess a timeless game or will it continue to plod its 1400-year journey toward being "played out"? In the days of chess variants, I believe we will seek acceptable alternatives long before chess (with the current starting position) is solved to a draw. Fischer Random could very well be the game we play. It is amazing to hear people claim an advantage with the first move, yet we have only begun to explore the theory of chess in the "modern" age. The real trick is in helping chess to survive is gaining new advocates and making it marketable to a mass audience. This may be the toughest challenge of all.